Those are super cute and I bet my kids would love these. They are perfect for summer. These are ADORABLE!! 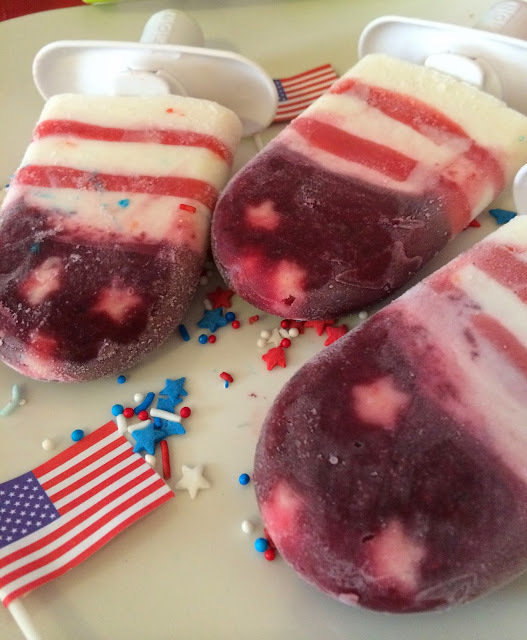 My kiddos would LOVE these as a treat anytime, but I just love the whole 4th of July theme! Those stars make it! I love how patriotic these are! Ice pops with a flair are always so fun! These are so festive! Fantastic! I loves these with the little stars in them! So cute & looks like a great way to cool off while the kids are playing outside. I love these! It's been so incredibly hot here this week that we are eating ice pops for every meal! Mmmmm these look so refreshing. Going to check out the recipe NOW! Those pops look yummy. And I love the patriotic look of them.